Lisa Simeone (LEFT) and Gina Deary at the Elysian Hotel and Private Residences. 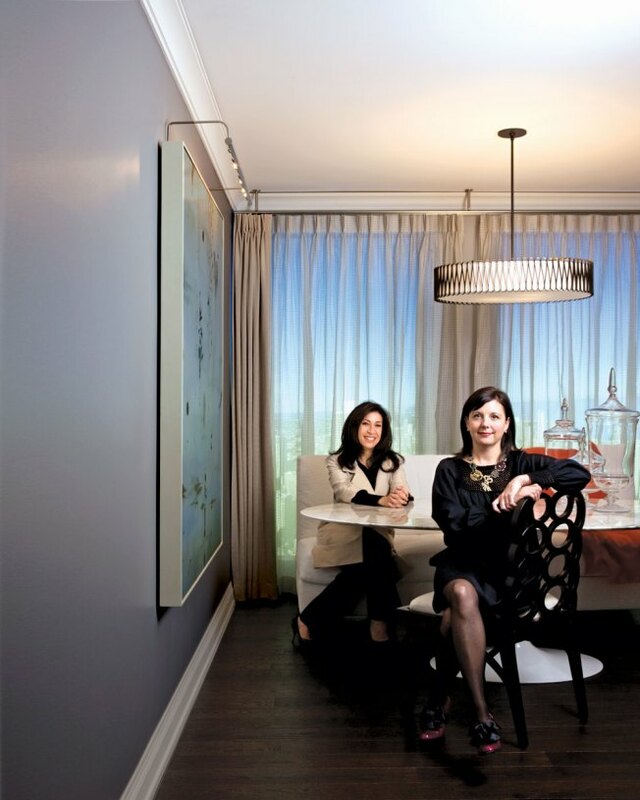 Gina Deary and Lisa Simeone, the fashionable founders of the Chicago-based Simeone Deary Design Group, had one principle guiding their work for the soon-to open Elysian Hotel and Private Residences: timeless glamour. Inspired by classic 1920s Parisian fashion (think Coco Chanel and Christian Dior), Deary and Simeone, who started their eponymous firm six years ago, are reinventing the hotel experience with their incredible attention to detail, strong vision, and intent to evoke emotion. Lavish, heavily embroidered textiles give guest rooms depth. A neutral palette with shades of black, gray, and cream complements the Elysian’s signature touches of pink and provides an inviting familiarity. Simeone says the hotel’s public spaces—which feature a clean, black-and-white-filled aesthetic paired with intense lighting—were designed to set the stage for a grand first impression, leaving guests eager to explore the rest of the space. “I’m most excited about the entry and lobby,” she confides. “They say it all.” A provocative, eclectic collection of photographs, tapestries, oils, and etchings adds contemporary flair to the classic concept. Elysian Hotel and Private Residences, 11 East Walton Street, 312-664-9500. Simeone Deary Design Group, 605 North Michigan Avenue, 312-274-0606. Visit Michiganavemag.com to read about more local taste-makers.